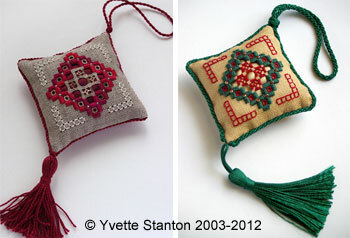 These brightly coloured Hardanger Christmas ornaments would look fabulous on anyone's tree. Use the leftovers in your stash to make these gorgeous little decorations. Both colour schemes shown are included in the pattern. Make yours using one of the colour schemes as shown or with a completely different colour scheme. You could try white fabric with a soft lilac overdyed thread, or cream fabric and soft green threads. The variations are endless! They are wonderful gifts for school teachers, carers, special friends and stitching buddies, and are great for stitching swaps. For those who don't celebrate Christmas, why not treat yourself (or a friend) to one anyway as they also make lovely key tassels? Chart and detailed instructions included. Worked on 28 count linen, with pearl cotton 5, stranded floss and seed beads.